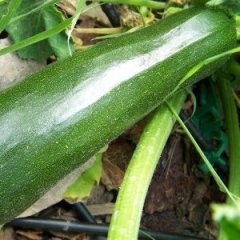 Anyone that has ever grown zucchini knows that a healthy plant is quite capable of overwhelming you with its steady yield of long, cylindrical squash. When it comes to those prolific bearers, zucchini can grow from a mere two inches in length today to be the size of a baseball bat tomorrow. And they keep coming, and coming and coming, so you try giving them away. It gets to the point where your neighbors run inside and slam the door when they see you heading their way with one of those green things under your arm. Don’t fret. There really are a lot of tasty things you can do with zucchini – large and small. Get creative. There are thousands of zucchini recipes out there. Here are some great ones from the foodnetwork. The smaller fruits, which are the most popular, can be sautéed, grilled, steamed, stuffed or eaten raw in salads or with dip. But what do you do with those older ones that have big seeds inside and tough skin on the outside? Some folks love to stuff them with a variety of things, including sausage, hamburger, bread stuffing, crab, seafood, cheese and a host of other things limited only by your imagination. A favorite recipe of mine is to turn those baseball bats into mock crab cakes. You can find recipes for these at www.abouteating.com and allrecipes.com. You will have people swearing that there is real crab in there! Come back and tell us which recipes you like the best. See you soon on the blog. Previous post: Can Asparagus Cure Cancer?